PHUKET: Police are hunting a for man who ran away after setting fire to a motorbike near Surakul Stadium in Wichit this morning. “The suspect, named Kwan, lives near the area. 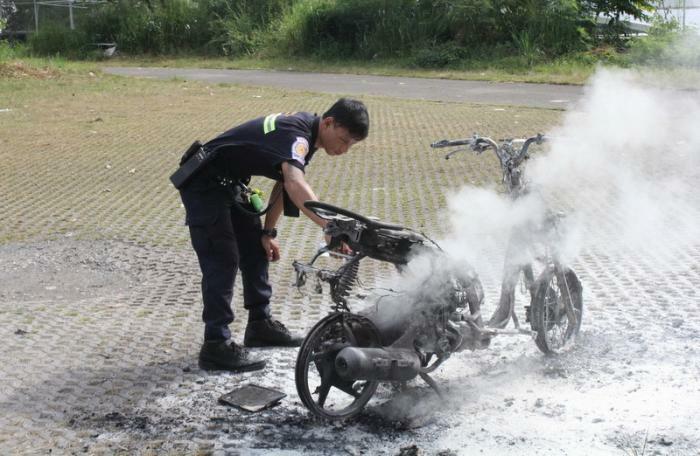 According to witnesses, he drove the bike out of his house about 10:30am, set it on fire and then ran off,” said Maj Narong Muangkhuang of Wichit Police. Rescue workers rushed to the scene and managed to douse the flames in 10 minutes. The motorbike, however, was completely destroyed.